Join us in our commitment to turn childhood dreams into reality by supporting THONTM. Together, Andrew Ramirez & Sarah Steele, are taking action by uniting with 16,500 student volunteers and over 25,000 alumni supporters in the fight against childhood cancer. Our year-long efforts culminate in a 46-hour, no-sitting, no-sleeping dance marathon each February to celebrate our survivors, remember those we’ve lost, and take a stand--all in hopes of one day dancing in celebration of a cure. Sarah is a senior studying Nuclear Engineering with a minor in Spanish. She spent her first three years of college fundraising for THON through her sorority, Phi Sigma Rho. Her sophomore year she was a part of a Rules and Regulations Committee, where she worked event security for THON weekend. She also donated over 12 inches of hair to Wigs for Kids in order to create a wig for a child with cancer. Then, her junior year she was a member of a Donor and Alumni Relations Committee, which enabled her to give tours to donors and send thank yous out to numerous generous donors. She is hoping to a join another committee and be as involved as possible with THON for her senior year. Her favorite THON memory was when a three year old girl approached her at THON weekend while she was on shift with her committee, and the girl asked to take Polaroid pictures of the girls on the committee. The girl gave the Polaroids to Sarah and was so excited to be able to play photographer, which reminded Sarah why she is so involved with THON. 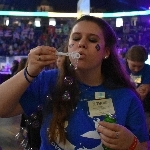 Sarah will continue to fight for THON so that every kid can be a kid. Andrew is a senior studying History and Political Science with minors in Spanish and Business. He is a manager for the Penn State Basketball Team so he spends a lot of his time helping out the team. He has really enjoyed helping making THON Hoops a success every year and loves attending other fundraising events like Phillies FTK and Noodles FTK. 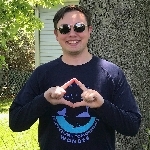 He wants to dance independently in THON this year to get more involved with this amazing organization and promote a great cause. Andrew supports THON so that one day no parent has to hear the words, "Your child has cancer," and every child can enjoy their childhood. Andrew Ramirez & Sarah Steele have been working tirelessly all year with the hopes of being selected to dance in THON 2019. Independent Dancer Couples are dedicated individuals who set up their own fundraisers throughout the year, and with the support of friends and family, will obtain tickets in a lottery system in the hopes of earning a spot as dancers in the Penn State Dance Marathon. With your contribution, you will bring Andrew Ramirez & Sarah Steele one step closer to being able to take a stand against childhood cancer during THON Weekend 2019.